Smaller business suffer greater from fraud. The bigger the business, the more employees, and the fraud costs skyrocket. Big businesses that have engaged in fraud end up paying ‘gazillions’ in violations, penalties, and legal fees. So why don’t they suffer greater from these mega fines? Because they’ve got equally prosperous shareholders, business partnerships, investments, and revenue able to cover these costs. That’s not to say these organizations don’t suffer the financial loss from occupational fraud, and the battering of their brand and image. But take a big global ‘box store’ for example. If they have to pay $500 million in FCPA fines, they’ve pretty much covered that in a day of sales world-wide (I don’t know if that’s completely true but you get the picture). Small businesses, typically 100 or less employees, don’t have the same cash flow to cover fraud losses, legal fees, and violations. If a small business found itself face to face with having to pay fines, cover financial losses, protect its brand and reputation, chances are it’s game over for that business… not always, but it’s certainly detrimental. Smaller businesses do suffer different types of fraud, compared to larger organizations, according to the ACFE’s Report to the Nations. And it certainly makes sense. Where big business might have the financial markets to “play” with and investors to defraud, small business fraud may be more geared towards cooking the books, defrauding vendors, falsifying invoices, etc. And compared to big businesses with many people ‘playing the fraud game’, all it takes is one bad apple in a small business to wreak havoc and cost the business more money than it has to play with. 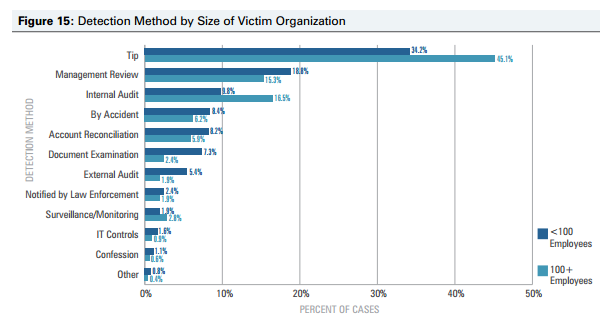 Also, smaller businesses are typically under protected by anti-fraud controls compared to their big siblings. This makes them considerably vulnerable to this threat. Resources for anti-fraud controls are limited in many smaller organizations, however, there are measures that a small business can take to fight fraud. We’ll get to that just below. First, take a look at some of these graphs, care of the ACFEs 2014 Report to the Nations document. Limited financial and human resources at many small businesses make them quite susceptible to fraud as they often lack the means to implement sophisticated anti-fraud controls. That makes the fraud aftermath quite devastating. Most controls require a big investment. However, there are more feasible tools smaller businesses can make use of. Anti-fraud policies, a Code of Conduct, and an ethics reporting system are very small investments, won’t break the bank, and go a long way in the fight against fraud. As employee tips are the number one fraud detection method, it just makes sense to implement an ethics hotline – here’s a few more reasons why. Join us tomorrow for fraud fact #3 – the higher the authority, the greater the fraud loss. And don’t forget, spread the word #fraudhurtsbad.